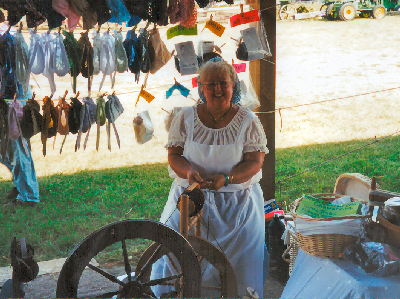 I, Sheran, had had the desire to spin for a very long time, when, in 1990, we met a lady who was spinning wool at Heritage Village , the traditional crafts area of the Minnesota State Fair. 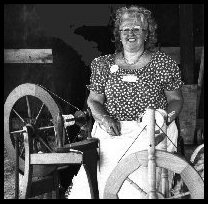 She told us that she had just returned from a week long traditional spinning course held biannually under the auspices of the Vesterheim Norwegian-American Museum in Decorah, Iowa. I got all excited about the opportunity and my husband Pete took my animated explanation of the encounter seriously enough to enroll me in the next available class. He took me to Decorah the next summer in our motorhome and played househusband for me during the week I was in school. 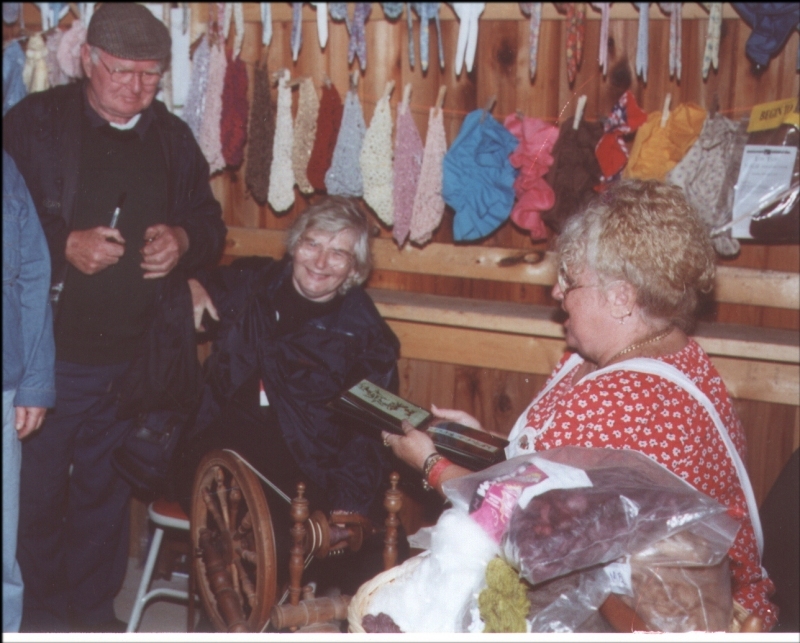 By Wednesday I was totally in love with spinning and by that night Pete had purchased a brand new Louet wheel for me. 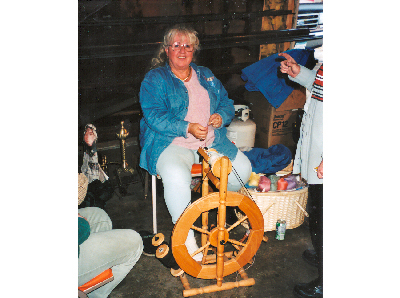 Before the week was out, our instructor, Kate Martensen had put us in touch with a kind Decorah lady who GAVE us an antique basket case German flax spinning wheel. It turned out to be complete, except for a couple of very minor parts and we had it running before we left town. What a whirlwind week! Pete had been demonstrating Blacksmithing for a few years by then, so later that same year, I started taking my new wheel with me to these events just to have something to do. But to our surprise, it drew such a crowd that I've been doing it ever since, now as an equal partner-demonstrator. 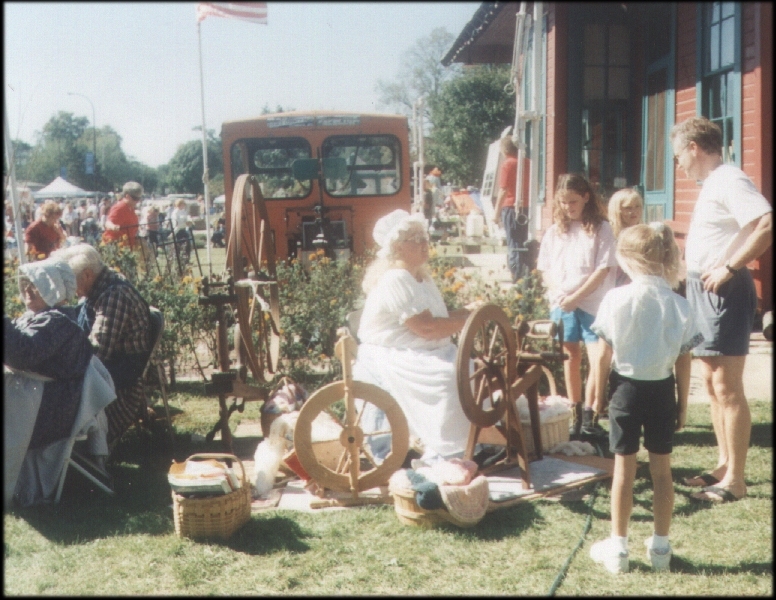 Here I am demonstrating at the Laura Ingles Wilder Days Celebration in Pepin, Wisconsin. This is me demonstrating ----well then, gabbing with the visitors--- in the brand-new Blacksmith shop at the Nowthen Historical Power Association Threshing Show in Nowthen, Minnesota. You'd probably be surprised at the number of men who stop by to watch. The older men are usually the ones whose mothers or grandmothers were spinners. They often have interesting and humorous stories to tell. I particularly like to get children involved. Many of them don't have the slightest idea what is going on. We bring a dozen drop spindles with us where ever we go and it is not uncommon to see a half dozen children sitting cross-legged on the ground in front of me carding, picking and spinning, when only a few moments ago they didn't even know what I was doing. I like to think that this is an experience they will remember for the rest of their lives. Since almost any fiber can be spun, I enjoy the opportunities presented to me when we demonstrate at locations that have animals, for we can often get their keepers to supply fur or hair for the wheel. 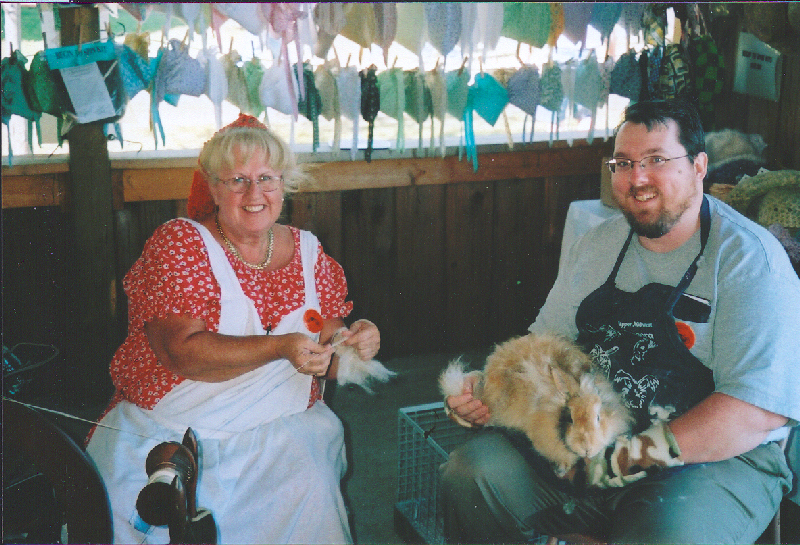 As you can see in the picture above, one of my favorite things to do with "wool-on-the-hoof" so-to-speak, is to have an Angora bunny on my lap (or on an animal keeper's lap)and then to pluck wool, card and spin, right on the spot. I like having a basket full of hand spun wool from which I can knit a project whenever I want. Although I am also a machine knitter, hand knitting my homespun yarn seems to make the project all the more special. I like the idea of taking the fiber all the way from the source to the finished product in the traditional way. All in all, I now own twelve wheels, most of which are gifts from my husband. And we have a traditional 30" Saxony wheel in the process of being built from scratch out of black walnut wood. My Louet, a castle style wheel, is my favorite, from a production standpoint, but people are more used to seeing a more traditional style wheel. So when I demonstrate, I usually bring my Ashford. And we often bring an antique Walking Wheel with us, both because of its 48 inch wheel's commanding size and to show the differences in technology between the simple pointed spindle and the "high tech" flyer and bobbin. There is one corner of our living room that is devoted to spinning. This allows me to pick up where I left off at any time. When I was growing up, my German and Swedish parents never wanted anything to occur in the home that wasn't somehow productive. So when I spin, I can sit on a chair and daydream and whistle or watch the birds and still feel productive at the same time. The wheel has a wonderful rhythm and a wonderful peacefulness and gives me wonderful relaxation. 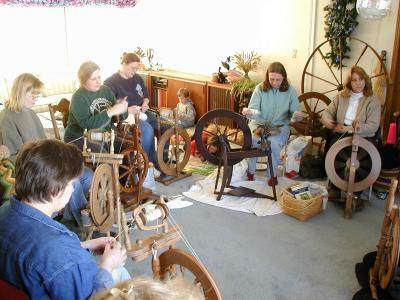 I am part of a group of local spinners who meet on Wednesday mornings to both spin and tell yarn(s). We rotate locations from one home to another. There may be as few as 2 or 3 spinners, or as many as a dozen at these weekly events. A Typical "Spinning" Wednesday at my house. 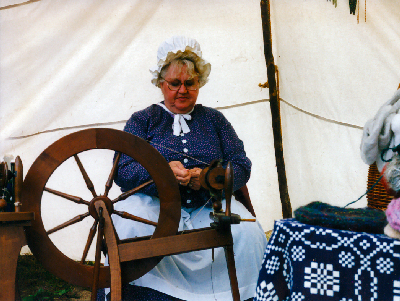 Here, she is using an Ashford Traditional spinning wheel.